This seems like a Sunday afternoon dessert. Ethereal, light, comforting and sweet. For many during the season of Lent, Sunday is a break from their chosen 40 day fast. We had to break our fast this morning as we had family in town and went to church and then they had to get a quick lunch and get on the road. So we had brunch out at our favorite place, Crafthouse. Does it count if we didn’t pay for the meal? 🙂 Anyway, we are dedicated to our no-eating-out fast and will continue throughout the weeks and will not plan on breaking the fast on Sundays. One of my plans for Lent is to plan meals that are more exciting than going out to eat – things we look forward to more than going to a restaurant! This fancy-schmancy dessert could make anyone feel as if they were at a posh little bistro having dessert and coffee! 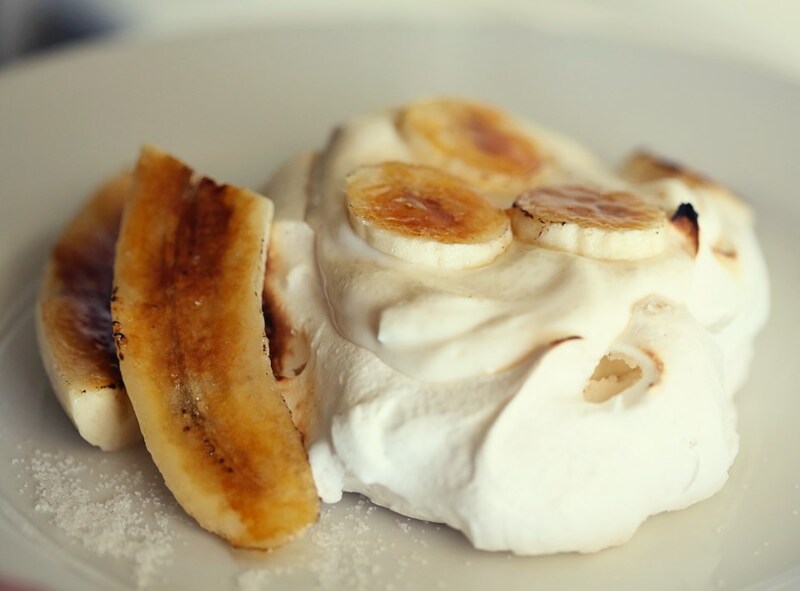 I’ve done a pavlova on this blog before, and I love how versatile they can be. A few weeks ago I bought this yogurt in a moment of weakness. I always buy plain yogurt and add my own sugar because flavored yogurts have SO MUCH SUGAR. However, I couldn’t resist the flavor description: honey salted caramel?! After we tasted it, Matt suggested it would be awesome on a pavlova and that we could add bananas and have it be a shockingly all-white dessert. Cloud like, from the Greek Gods themselves. I added vanilla bean to my pavlova and torched raw sugar on top of the bananas and with the combination of the salted caramel tanginess of the yogurt, it made an incredible dessert! It makes me want to try lots of different combinations with various yogurt flavors! I’ll post my pavlova recipe for you, here, again and you can do whatever toppings you can dream up! Place rack in the middle of the oven and preheat the oven to 275°. Line a large baking sheet with parchment paper. Stir the cornstarch into the sugar in a small bowl. In a large bowl of a heavy-duty mixer, fitted with whisk attachment, whip egg whites, cream of tartar and salt, starting on low, increasing to medium speed until soft peaks start to become visible, approximately 2 to 3 minutes. Increase speed to medium-high, slowly and gradually sprinkling in the sugar-cornstarch mixture. A few minutes after these dry ingredients are added, slowly pour in the vanilla. Increase speed a bit and whip until meringue is glossy, and stiff peaks form when the whisk is lifted, 4 to 5 minutes. Pipe or spoon the meringue into 8-10 large round mounds that are 3 inches wide on the parchment-lined baking sheet. With the back of a spoon, create an indentation in the middle of the mound for holding the filling once meringue is baked. Place baking sheet in the oven. Reduce oven temperature to 250°F. Bake for 50-60 minutes, or until the meringues are crisp, dry to the touch on the outside, and white — not tan-colored or cracked. The interiors should have a marshmallow-like consistency. Check on meringues at least once during the baking time. If they appear to be taking on color or cracking, reduce temperature 25 degrees, and turn pan around. Gently lift from the baking sheet and cool on a wire rack. Will keep in a tightly sealed container at room temperature for a week. 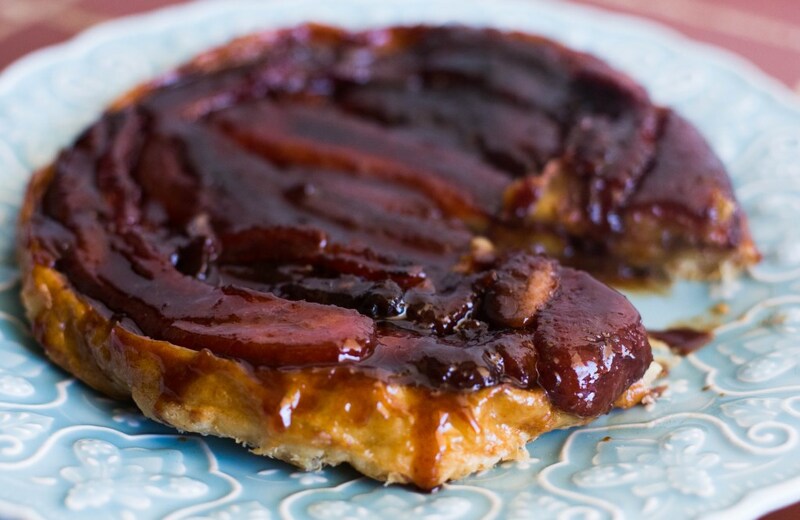 My mom and dad got me an awesome tart tatin pan for my birthday this year and I couldn’t wait to use it. I had a recipe from Martha Stewart saved on my phone for the longest time and hadn’t gotten around to making it, but when I received this pan in the mail and looked at my five mysteriously mushy bananas on my counter, I knew what had to be done. Okay, so the mysteriously mushy bananas – I bought a perfectly yellow, no bruise bunch that were on the top of the pile, and a day later, I went to cut up one for Olive and they felt like bags full of jelly. ALL OF THEM. Still perfectly yellow, still no bruises, but all mush. What in the world?! I thought maybe since I’d put them beside tomatoes, that maybe the gasses from the tomatoes instantly ripened the bananas? So a day later, I bought another bunch and put one banana with the tomatoes and the rest far away from them and the banana that was with the tomatoes was fine. So, the mystery remains. Maybe they were on the bottom of the truck since they were on the top of the pile! Despite their mushy texture, the bananas worked out perfectly for this recipe and I was glad to be able to use them. The French love their tart tatins. They basically do it with every fruit in season. And my theory is that the French use fancy terms to make ordinary dishes sound fancy. Like tartines. Tartines are various toppings on toast. That’s it. Some might call it bruschetta, some call it toast. It’s all the same. 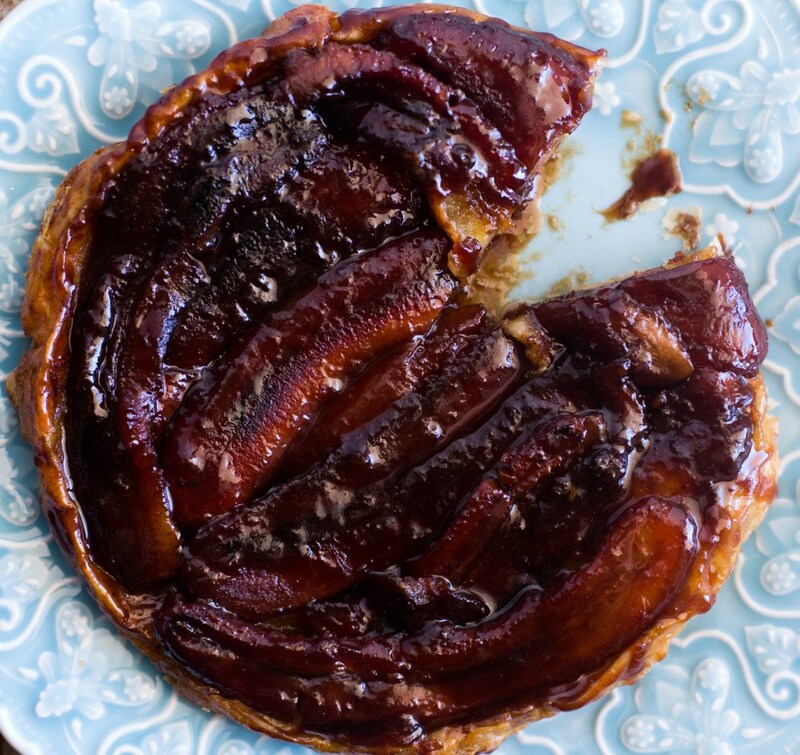 Or how about this tart tatin? Yeah, it’s an upside down cake/tart. 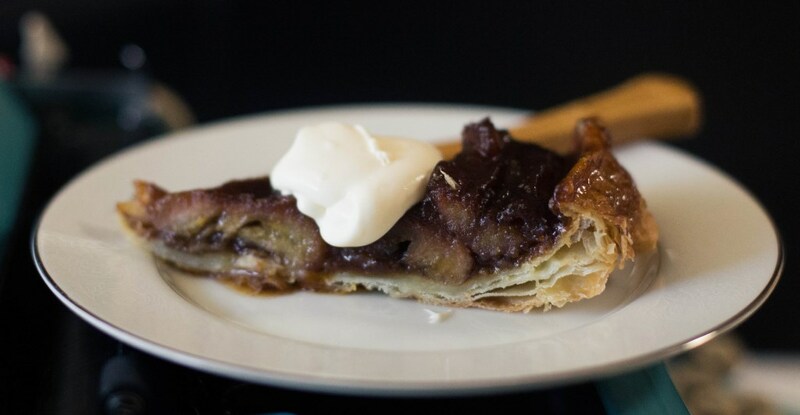 They typically use puff pastry instead of cake batter, so the result is a crispy, almost turnover texture with caramelized fruit on the top. It’s a wonderful way to use up old fruit and to do something really simple in a hurry for guests. 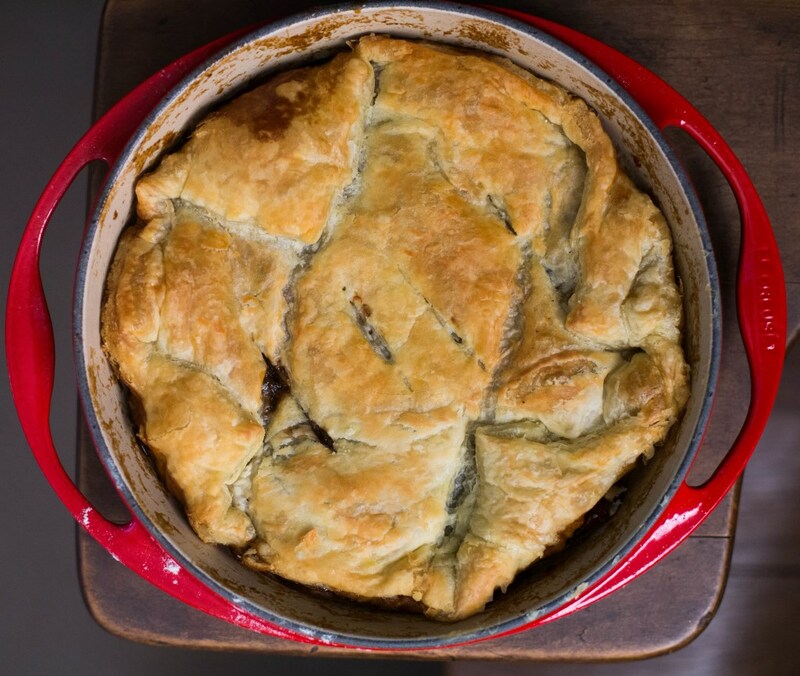 And you should always keep frozen puff pastry on hand. It’s a freezer staple for me. You can use it in so many ways from topping little strips with shredded cheese or sausage or peppers for an instant appetizer to using it as a base for a cobbler, strawberry shortcake or whatever you can dream up! Preheat oven to 400 degrees. Roll out pastry on a lightly floured work surface to a 13 1/2-inch square. Using a large skillet as a guide, cut out a 12-inch round. Transfer pastry round to a baking sheet lined with parchment paper, and refrigerate until firm, about 15 minutes. Make three 1/2-inch slits in center of round; set pastry aside at room temperature. Melt butter in a 12-inch skillet over medium-high heat. Stir in sugar, cinnamon, and salt. Cook, swirling skillet occasionally, until mixture turns medium amber, about 3 minutes. Arrange bananas in skillet, overlapping slightly. Cook, without stirring, 3 minutes. Drizzle vanilla and rum over bananas, and cook until most of the rum has evaporated and liquid has thickened, about 1 1/2 minutes. Remove from heat. Place pastry round on top of bananas, and transfer to oven. Bake until pastry is golden brown and puffed, about 25 minutes. Remove from oven, and carefully invert the tart onto a serving plate. Whisk creme fraiche until fluffy, about 3 minutes. Serve dessert warm or at room temperature with the creme fraiche. *I didn’t adapt this Martha Stewart recipe at all, except that my tatin pan was 9″ instead of the 12 the recipe calls for. I didn’t have too many bananas – it worked out perfectly.